Living in an era filled with ultra-modern technologies and “digital youngsters”, primeval watchmakers like Tudor and Rolex have suffered very significant strife. Due to the high rise of smartwatches, most traditional luxury watches have not been able to penetrate as they had aspired, though still, they have managed to strengthen their reputation. As one of the rising stars, the lineup of Tudor Black Bay has been doing really well since its debut in 2012. In 2013, the watch collection won the Revival crown at Grand Prix d’Horlogerie de Genève, marking its third reward in one year. Following that the lineup has won other two prizes in London and Singapore, this was great assurance it has more sweets on the way. Following its commitment to serving divers’ optimally, Tudor Black Bay marked its 6thanniversary with several new models and upgrades that’ll make the underwater experience even better. As well as top a distinctive elegance on those looking for a modern traditional nostalgia. Let’s look at some of the novel watch models that the iconic brand has presented lately. 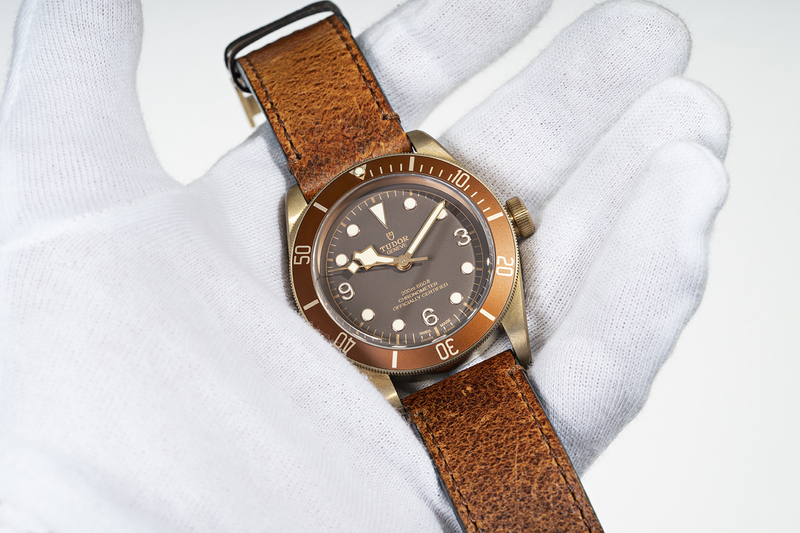 Generally, Tudor’s focus on the Black Bay collection is to recreate its old watch models in a modern style. This way, the brand will be able to get access to the enthusiasts of vintage models, whilst serving those looking for modern luxury watches. As one of the models honoring this essence, the new Tudor Heritage Black Bay 58 has its design in conformity with the brand’s first divers’ watches. If it’s the hands, the timepiece has the same old angular snowflake hands, though in yellow gold. To ensure uniformity, the hour markers, dial chapter, and 60-minute calibration of the unidirectional rotatable bezel are in gold as well. Similar to the inspirer which had a 39mm case and Big Crown, the new Tudor black Bay 58 also possess these features, although its steel has a satin finishing. To allow you to enjoy a modern ticking from the historic hood, the blacked-dial divers’ watch houses a modern Caliber MT5402 self-winding movement. Unlike with Caliber 390 which Rolex designed for Tudor’s Submariner, Caliber MT5402 is a certified chronometer which Tudor has developed in-house entirely. Powerful and ultimately precise, this movement can run for up to 70 hours nonstop. Heritage Black Bay Fifty-Eight Stainless Steel (Ref. 79030N-0001)- in this model, the watch version has a riveted steel bracelet with a satin finishing and a folding safety clasp. 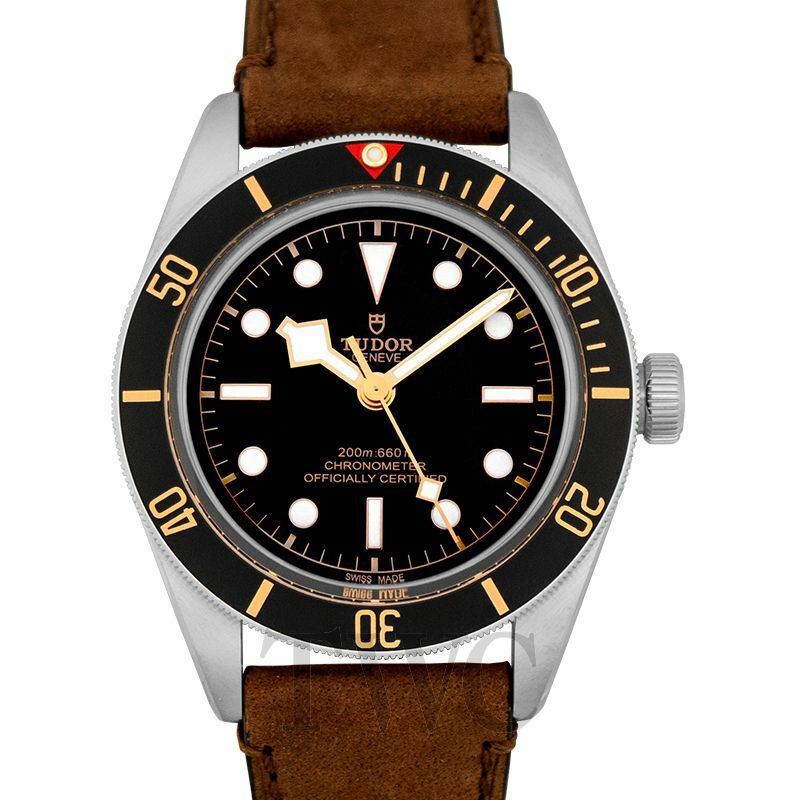 Tudor Heritage Black Bay Fifty-Eight Leather Brown (Ref. 79030N-0002)- comes with a brown leather strap which has a folding safety clasp. Heritage Black Bay Fifty-Eight Fabric Black (Ref. 79030N-0003)- the watch’s strap is a black and beige fabric with a gold-colored band. This design is one of Tudor’s signature which features the ancient jacquard style. Due to its robust domed sapphire crystal and the sturdy steel case, all the three versions of Tudor black Bay 58 have waterproofness of up to 200 meters. Similar to the rest of Tudor watches under the Black Bay collection, the Black Bay GMT bears its heritage from Tudor’s divers’ watches of the ‘50s. However, the watch also has some features belonging to a Rolex’s model, making it a blend of three designs including the modern Tudor-manufactured movement. After its debut during Baselworld 2018, Tudor Black Bay GMT was met with a warm reception following its historic casing. On the outer casing, the watch has a bidirectional blue and matt burgundy bezel which seems identical to the Rolex “Pepsi” GMT. With the support of the large screw-down winding crown and the satin-brushed steel case, the 41mm watch has waterproofness of up to 200 meters. On the inner casing, Tudor Black Bay GMT has a matte black dial with luminous angular snowflake hands from the Tudor’s original divers’ watches. To ensure the watch is optimally readable even in dark backgrounds, the crafters fitted its hour markers with a luminescent coating as well. Similar to the Black Bay 58, the new GMT runs with a new movement which Tudor has created entirely in-house and exclusively for the Black Bay GMT. As a certified chronometer, the 26-jewel Caliber MT5652 movement can reserve power for up to 70 hours. While still offering the precision of time and date. Tudor Heritage Black Bay GMT Black Steel/NATO (Ref. 79830RB-0003)- this model has a black fabric strap with a burgundy band. 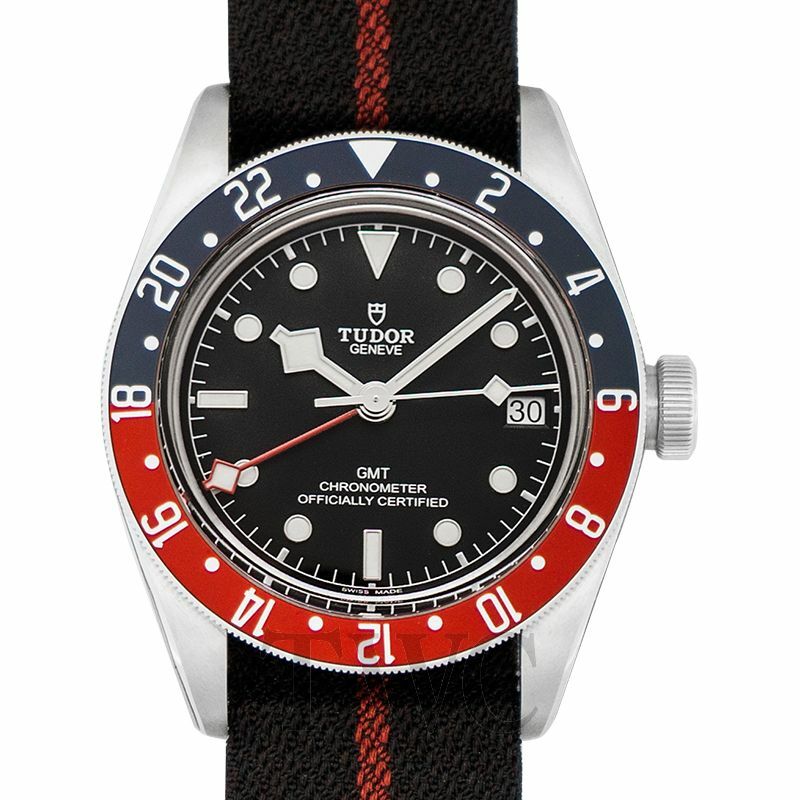 Similar to that of Black Bay 58, the strap is one of Tudor’s signature featuring the jacquard technique. Black Bay GMT Black Brown Leather (Ref. 79830RB-0002)- it has a “Terra di Siena” brown calf leather strap with a folding safety clasp. Black Bay GMT Black Stainless Steel (Ref. 79830RB-0001)- the model has a highly-polished steel bracelet with a satin-finishing and a folding safety clasp. For the lovers of classic elegance, Tudor Black Bay 36 features a fashionable sporty aesthetic from its combination of classic and Tudor’s pioneering divers’ watches. Unlike the other two Black Bay models we have just discussed, Black bay 36 comes with a black or blue dial. Either of the dials holds angular snowflake hands and dotted hour markers with a luminescent coating. On its steel satin-finished case, the 36mm Tudor Heritage Black Bay watch has a fixed smooth bezel, alongside a Big winding Crown. The watch comes with four different straps, leaving 4 versions of the model for the Black dial and another four for the blue dial. The four straps are steel bracelet, black fabric, or Brown or Beige leather strap. Despite the watch marking its debut one year after Tudor began making its own movement, the watch uses ETA caliber 2824-2 movement. The encompassed models, natheless, are as well waterproofed to a depth of up to 150 meters. Although you might find some models of Tudor Black bay with some similarities to the Rolex model, its status has still remained. Each of the two brands, obviously, is a sister company to the other, thus some similarities will be there. Some of the world celebrities who have been spotted wearing a Tudor Heritage Black Bay watch are Will Smith, Lady Gaga, David Beckham, etc.